If you want a rabbit, you may not be able to get one in Port Moody pretty soon. The city is supporting Richmond’s efforts to ban the sale of rabbits in pet stores following an explosion in the Easter mascot’s population in local parks. A letter from Richmond calling for similar bans in neighbouring municipalities said such a move would reduce the number of domestic rabbits dropped off in local parks, curb the impulse purchase of rabbits and promote responsible pet ownership. PoMo staff will prepare a bylaw amendment to ban bunny sales in local stores. The city will also send a letter on the matter to the Union of B.C. Municipalities. Comment: Many people are taking action by writing their local elected officials to amend existing pet shop regulations that would prohibit the sale of rabbits in pet stores. It appears that they are finally listening. Carmina Gooch’s latest letter to the City of Vancouver, March 29, 2010. The Rabbit Advocacy Group of BC is once again kindly requesting that the City of Vancouver create new bylaws that would restrict the breeding and selling of unsterilized rabbits, as well as exact an entire ban on sales of rabbits in pet stores. Most of these mammals are bought on impulse without any knowledge of their complex needs. The vast majority are illegally released by their owners into Lower Mainland municipalities within six months of purchase. The gestation period is roughly thirty days with an average of six kits per litter. Humane societies, rescue groups, and the pounds are always at over-capacity with unwanted rabbits, and finding good and lasting homes for these animals is extremely challenging. We don't need more rabbits being bred for show, as breeding stock, or as pets. Petco, a national pet retailer in the U.S. adopts only sterilized rabbits, with CEO Jim Myers saying it's good for business and the right thing to do. Tisol, Bosley's, and other pet stores in Metro Vancouver sell pet food and supplies only, and are very successful. The many unwanted 'pets' that end up thoughtlessly dumped into the ecosystem vie for survival, often meeting cruel and untimely deaths. Others thrive and form colonies, upsetting the natural environment. Whatever the species - rabbit, cat, bird, or iguana, government action at the local level must be part of an overall and coordinated strategy in helping prevent the costly consequences of human behaviour and irresponsible businesses. Due to the invasiveness of quaker parrots, for example, some states in the U.S. have outlawed the importation, selling, releasing, and mere possession of these birds. Kelowna and Richmond have prohibited the sale of rabbits in pet stores. The issue is expected before District of North Vancouver Council in early May. Port Moody is supporting Richmond’s efforts, following an explosion unwanted pet bunnies dumped in local parks. A letter from Richmond calling for similar bans in neighbouring municipalities said such a move would reduce the number of domestic rabbits dropped off in local parkland, curb the impulse purchase of rabbits and promote responsible pet ownership. Staff will prepare a bylaw amendment to ban bunny sales in local stores. The city will also send a letter on the matter to the Union of B.C. Municipalities. We applaud these measures and would like to see the City of Vancouver on board. We look forward to hearing if this important matter has been addressed in any way since our previous correspondence in the Fall of 2009. Pet Habitat is continually selling rabbits, knowing full well that baby bunnies are an impulse buy. The sole motivation is money. We've been told by several franchisees that "it is understood" that there is a no return policy. People, be responsible! If you're seriously interested in providing a lifetime home for a rabbit, visit your local shelter or rescue group. Municipalities are finally taking action by implementing bylaws that prohibit the selling of rabbits in pet stores. West Vancouver has yet to address the issue. On April 12, 2010 Carmina Gooch, RAG BC wrote to WV Council and copied the WV and BC SPCA. The Rabbit Advocacy Group of BC has past correspondence with you regarding concerns over the selling of unsterilized rabbits at Noah's Pet Ark, Park Royal. Pet Habitat took over operations in November, 2008, and our volunteers have been regularly monitoring the store ever since. Earlier this month, and just before Easter, I made a visit to the business, and spoke with an employee, after noticing a rabbit with newborns in a cage. I was told that a customer had brought in this bunny for resale, and that several days later the pregnant doe had given birth to several kits. Meanwhile, there were other young rabbits for sale, as well. This morning, I was contacted by Vancouver Rabbit Rescue and Advocacy, a volunteer charitable organization, about a situation in West Vancouver. I was asked to follow up on it, and contacted a young woman, who told me that a friend had recently purchased a lop-eared rabbit from Pet Habitat in Park Royal, and due to allergies, was unable to keep 'it.' Other friends were also unable, or didn't want the responsibility of a 10 year commitment, either. The bunny was surrendered to our group. I went directly to the store, and spoke with the franchisee. I explained that this rabbit was purchased on impulse, that the young woman didn't know anything about proper care, that she was experiencing an allergic reaction, and that she was not told of the no return policy. I was told that "it is understood" that there are no returns. I didn't see anything in writing at the counter or anywhere on the premises, stating this. After some discussion, he said the rabbit could be returned, but without financial reimbursement. The rabbit will not be returned so that the proprietor can profit doubly by the re-exploitation and resale of this little creature. If rescue groups, humane societies, or the SPCA are full, and cannot take unwanted pets, owners will dump them wherever they find convenient. Rabbits have been abandoned into municipalities all over, with cities like Kelowna, Richmond, and Victoria, very much in the news, about this issue. I strongly urge the District of West Vancouver to follow Richmond and Kelowna's example and amend existing pet shop regulations to prohibit the sale of unsterilized rabbits in pet stores. The District of North Vancouver, Victoria, and Port Moody are in the process of doing so. Port Moody will also send a letter to the Union of B.C. Municipalities regarding this very necessary and long overdue measure. A response at your earliest convenience is requested. Additionally, I suggest that the SPCA check the store to ensure compliance with proper animal care and housing guidelines. New Westminster, Coquitlam, and the City of North Vancouver are preparing bylaws to stop the sales of intact rabbits. Despite writing back to the District of West Vancouver regarding this issue, we have not had a response. The Rabbit Advocacy Group of BC would like to express its strong support of legislation to address the breeding and selling of unsterilized rabbits. Baby bunnies are often purchased on impulse by people uninformed and unprepared to care for a rabbit for 10 years or more. Generally speaking, these 'pets' are abandoned within months. Sadly, most are thoughtlessly discarded outdoors and rapidly reproduce, leaving communities to deal with the consequences of irresponsible human action. Shelters and rescue groups are at over-capacity with unwanted rabbits. Municipalities like Kelowna, Richmond, and the District of North Vancouver have passed bylaws banning the sale of intact rabbits in pet stores. Preventative measures will go a long way in alleviating potential future problems. Animal welfare is an important issue and concerns all of society. Thank you for your attention to this important issue. We look forward to new and progressive legislation banning the sale of fertile rabbits. Rabbits sold in pet stores are not usually spayed or neutered, which means when they are released into the wild, they are able to reproduce. Feral rabbits are now a common site in many local parks. Update: Rabbits must be spayed or neutered if they are sold in Coquitlam after city council voted Monday night (June 7) in favour of measures aimed at reducing the number of rabbits living in parks. Coun. Mae Reid ended up voting against her own motion after amendments were tacked on by her council colleagues that would allow for the sale or rabbits, providing the animals are fixed. She wanted a total prohibition or nothing. You can read more in the Tri-City News: Coquitlam stops short of full bunny ban. Other municipalities with similar regulations banning sales of intact rabbits are Kelowna, Richmond, and the District of North Vancouver. June 2010 On Monday, the 16th, New Westminster City Council gave three readings to a bylaw that would prohibit the sale of rabbits in pet stores. The intent of the bylaw is to lessen regional concerns relating to domesticated rabbits being released into nature parks and other areas. 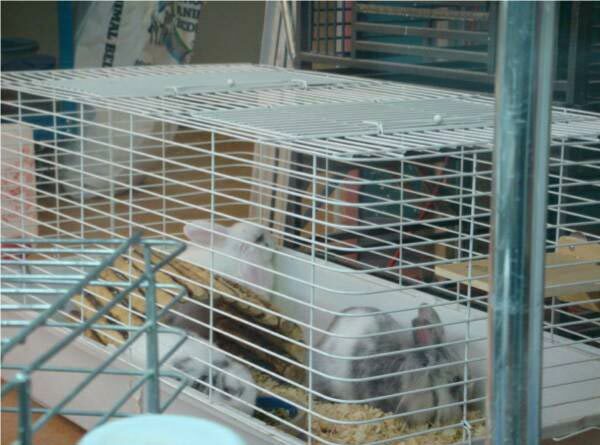 Although city staff is unaware of any stores that currently sell pet rabbits, the pet store bylaw would prohibit the sale of rabbits in pet stores and prevent it from being done in the future. 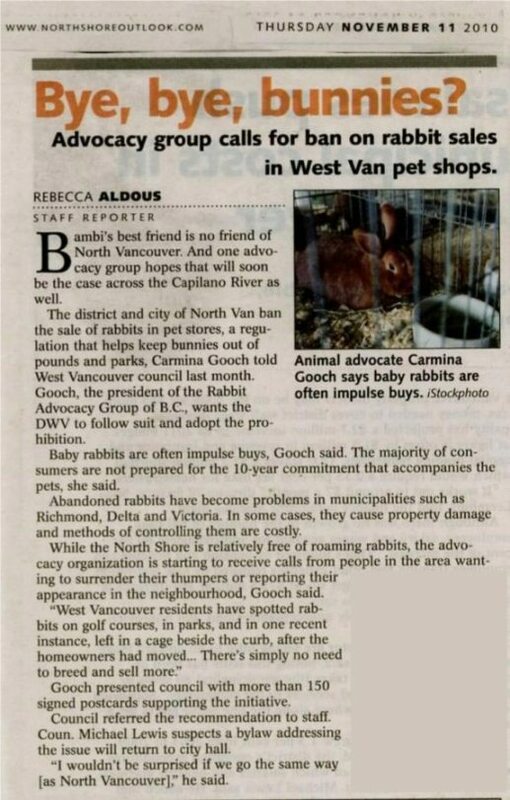 Monday, July 12, 2010, Carmina Gooch, of the Rabbit Advocacy Group of BC, spoke before Council on the motion of banning the sale of rabbits in North Vancouver City pet stores. We also presented numerous postcards with signatures supporting the ban. Our efforts were successful in the District of North Vancouver, where a new bylaw requires all rabbits to be sterilized before being sold as a pet. Violators face a $150 fine. Our A 10-second decision or a 10-year commitment? cards have also been presented to other municipalities. September 20, 2010 A bylaw to amend Pet Establishment Regulation Bylaw, 1998, No.7040 to prohibit any rabbit to be sold or offered for sale in establishments in the City of North Vancouver has been passed by council. September 29, 2010 Mr. Churchill, Manager of Bylaw Services in Nanaimo, has informed us that in response to Carmina Gooch's e-mail supporting a ban on the selling of rabbits in pet stores and other public venues, that the only recommendation coming before Council on Monday October 4th deal with 1) No Feeding Feral Rabbits & Deer and 2) Illegal to Abandon Rabbits In Municipality. November 1, 2010 West Vancouver’s bylaw manager informed us several weeks ago that staff has been preparing a report regarding the selling of rabbits in pet stores for Council's consideration. Although it was not included on today’s agenda, it was suggested we speak to the issue, regardless. As part of Rabbit Advocacy’s presentation, Carmina Gooch presented numerous signed postcards from supporters of the initiative to ban sales of fertile rabbits. Impulse buying contributes greatly to the neglect and abandonment of rabbits into our communities. West Vancouver residents have spotted rabbits on golf courses, in parks, and in one recent instance, left in a cage beside the curb, after the homeowners had moved. Read article in North Shore Outlook 11/11/10. December 6, 2010 The agenda for West Vancouver Council tonight includes a recommendation by Bob Sokol, Director of Planning, Lands and Permits that Business Licence Bylaw No. 4455, 2005 Amendment Bylaw No. 4656, 2010, to prohibit the sale of rabbits in pet stores be introduced and read a first, second and third time. From the report: Earlier this year, Council was petitioned by the Rabbit Advocacy Group of BC to follow the example of other local government jurisdictions and prohibit the sale of rabbits in pet stores. Pet Habitat is the only retailer selling rabbits Our concerns included the lack of adequate care and ‘housing’ of rabbits, as well as a general policy of no return if the animal becomes ill or unsuitable. West Vancouver staff have reviewed our request and in speaking with other jurisdictions endorse an outright ban of selling rabbits, as the costs and administrative difficulties of enforcing a ban on unsterilized rabbits would be too high. Victory! Council voted unanimously in favour of banning rabbit sales in pet stores. In speaking with an employee at Pet Habitat the following day, we were told that they were aware of the new bylaw, and will hold the one remaining and somewhat aggressive rabbit until a suitable home is found. A fourth reading next Monday will have the bylaw officially adopted. It will be effective immediately. December 31, 2010 It’s finally happened – Pet Habitat has closed its doors and is out of business in the District of North Vancouver. February 10, 2011 The City of North Vancouver’s Pet Boutique and the Pet Habitat in Park Royal, West Vancouver have contravened the bylaw by having rabbits for sale. Both store owners claimed ignorance. In fact, Pet Habitat’s manager and/or owners have flouted the bylaw by adding two additional rabbits to the two already for sale on Feb.10. West Van officials were apprised of the situation by the Rabbit Advocacy Group. Bylaw officers went to the store and despite requesting the store operators to remove the bunnies from public view and have the breeder pick them up, they were still in the store on the 21st, minus one that was a “presale,” but with no proof of the transaction. We were advised that the store will be fined if there is non-compliance. We have also informed Park Royal management of the bylaw breach. Thanks to everyone who regularly checks this store and keeps an eye out for the animals. If you have any concerns such as the health or the sourcing of any pet shop creature, please report it. The rabbits were finally picked up by the supplier on March 2nd. March 8, 2011 Pet Habitat, Park Royal, has changed its name to CanPets. June 22, 2017: Vancouver councillor seeks ban on pet store sales of dogs, cats and rabbits. Heather Deal has put forward a motion calling for a ban on the sale of puppies, kittens, and bunnies at retail pet stores. "We're doing this because a lot of other cities have already done it — places like New Westminster, and Richmond and because of a recent store opening here in Vancouver has raised a huge issue around this," she said. June 29, 2017 update: Vancouver council voted unanimously to ban sales of dogs, cats, and rabbits in pet stores. It received over 1,200 e-mails asking them to do so. It is the latest city in the Lower Mainland to enact such a ban, following other municipalities including Richmond and New Westminster. Motion B.5 was prompted by concerns of recently-opened Granville Pet and Garden in Marpole. Owner, Ernest Ang, has been the subject of numerous complaints in the past. In 2010, Ang owned a franchise of Pet Paradise, which closed in 2011 in response to the Richmond pet sale ban. In March 2012, Ang’s Pet Habitat in Burnaby closed after numerous complaints from the public to the SPCA, the City of Burnaby and Brentwood Town Centre. In 2015, Pet Habitat at Metrotown Mall was also shut down due to countless issues and negative publicity. NB: Overall, society’s values with regard to animal welfare and animal rights is evolving and consumer buying behaviour is reflecting that change. However, in addition to pet stores and classified ads, websites and online classified sites are ways that animal mills sell pets to naïve customers. Don’t be duped! July 12th update: We heard from Mayor Richard Stewart, who, in part, wrote: In light of the specific—but positive—situation in Coquitlam (no pet stores selling these animals, no overcrowding at the Coquitlam Animal Shelter, several bylaw rules that already prohibit home breeders and establish general animal welfare conditions) we determined that the facts necessary to establish a valid and enforceable prohibition did not exist. Stewart also mentioned the recent provincial regulations targetting dog and cat breeders. August 14, 2017 Nanaimo City Council will be discussing a motion to ban the sale of cats, dogs & rabbits in stores after recent correspondence from Leon Davis, manager of the City’s SPCA. The Rabbit Advocacy Group also wrote Mayor McKay, councillors, and other departments regarding this matter. We have done so in the past, as well. Domestic rabbit colonies can be found throughout the Regional District of Nanaimo, including on the Nanaimo SPCA acreage. Concurrently, there are many rabbit breeders plying their trade, unchecked. It was highlighted that new amendments to the Prevention of Cruelty to Animals (PCA) Act be expanded to include a regulatory or licensing system for rabbit breeders, as well as for those who breed dogs & cats. September 1, 2017 We also contacted the City of Surrey on this same matter. Surrey has a very large population of feral cats and their offspring, and to a lesser extent, rabbits, although that number is growing. Kathy Powelson, executive director of Paws for Hope Animal Foundation, spoke to council on September 11th, outlining a myriad of reasons for stopping sales of dogs, cats, and rabbits in retail outlets. October 16, 2017 Puppies, kittens and rabbits won’t be available in Delta pet stores any more, thanks to a new bylaw that was unanimously approved by council this evening. Animals will be allowed to be sold in stores if they come from the Delta Community Animal Shelter or another recognized rescue group. The bylaw comes in effect November 1, 2017. March 12, 2018 Surrey bans retail sales of dogs, cats and rabbits. Business License Bylaw, 1999, No. 13680 is further amended by inserting a new definition of "Pet Store" & a new section 55.1 (1) in order to ban the retail sales of dogs, cats, & rabbits. Over 70 rabbits ended up in the Surrey Animal Resource Centre last year, with only three of them eventually being reunited with their original owners. There are currently 30 rabbits at the shelter. Further news: Pet Habitat, District of North Vancouver, new rabbit bylaws, come on Burnaby! More under Rabbit Issues and Advocacy Page!